Roma Judaica with Sonia Schlossman offers you the opportunity to enjoy unique tours to Rome, guided walks in Jewish Rome and lectures about Jewish history and the origin of Christianity within Judaism. 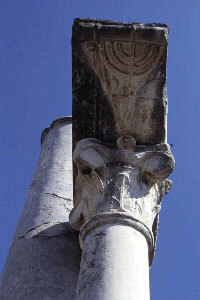 Jewish Rome is Jewish history. It is also a story for Christians and others with a general interest in history, who wants to know more about Christianitys origin in Judaism and the encounter between Judaism and Christianity. Nowhere in Europe is this encounter as evident as it is in Rome. Rome is the place where the Temple treasures from Jerusalem were brought when Judea was suppressed in 70 AD. In Rome stands the Arch of Titus commemorating the Roman triumph and the Jewish Diaspora, here Christianity grew and developed over the years, here the Jews were oppressed by the Popes and the Church but also protected by them. In Rome Jewish history and Jewish destiny have been shaped for centuries.